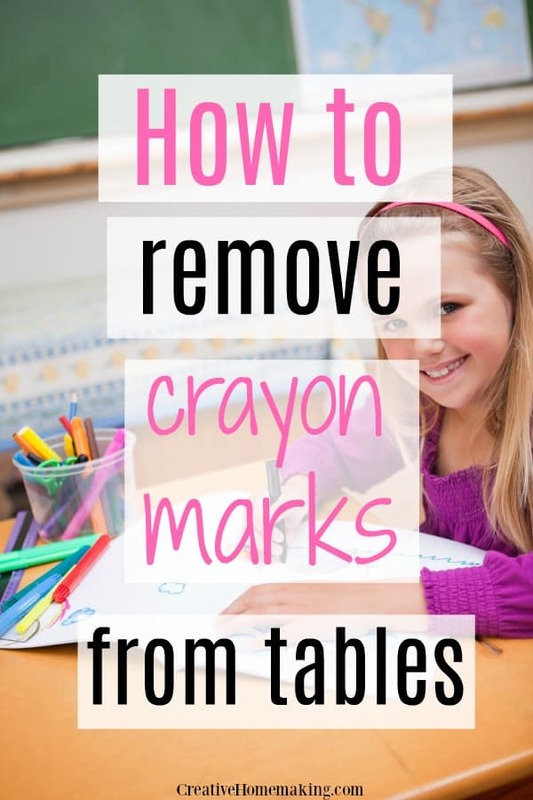 January 9, 2016 0 comments on "How to Remove Crayon Marks from Tables"
Q: I am on the cleaning crew for my church and the classroom tables are FULL of crayon marks. I’ve tried disinfectant spray, windex and scrubbies and these don’t work. I also tried rubbing alcohol and this didn’t work either. Any tips for removing crayon marks from tables? Tip #1: White vinegar did the trick!!! Tip #2: Mr. Clean’s “Magic Eraser” works great on all scuffs and crayon marks without scratching, and using just water! Tip #3: By accident I found out that Shout will take out crayon and permanent marker off the walls and wood work!! Tip #4: Plain old baking soda or laundry soap (POWDER form) and a moist terry cloth do the trick! Tip #5: Toothpaste, any will work although the white toothpastes work a little better than the gels get crayon marks and markers off tables and walls!